Streamline is a LED light installation occupying the central atrium of the Pittsburgh International Airport. Understanding the unique hub that Pittsburgh is for technology and art, our installation bridges these elements via a light animation that welcomes visitors as they enter and leave the airport. The installation hangs from the ceiling of the terminal and visualizes the flow and topography of Pittsburgh's three iconic rivers. The gentle, but still dynamic, nature of flowing water acts as a calming influence on passengers and guests. 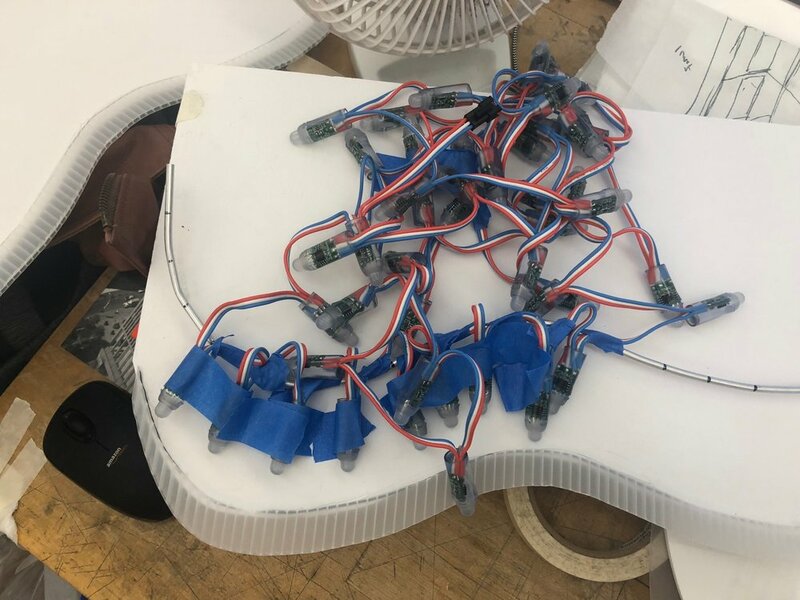 When designing the housing for this prototype, we experimented with many various types of opaque and transparent materials. We also worked to determine the spacing of the lights along the edge of each individual piece. We decided to use white acrylic as the main housing material, with the interior lined with thick paper to reduce hotspots. The more transparent material the showed the ambient lighting is made from frosted acrylic and milk jug plastic. Our installation's physical housing is located between the terminal's two main trusses. It consists of rows of thin individual housing for every strand of our addressable LEDs. While their lengths remain consistent, the change in their heights, among and throughout each house, accumulate to an abstract, representative display of the three river's topography. The light animation we've developed is suggestive of Pittsburgh's three rivers, a trait very identifiable to the city. Our color palette of deep blue, pale white, and pink promote a calming presence while also harmonizing with the terminal's existing blue, white and red interior. The pace of our animation is slow and steady with peak points of change in color and motion to build upon the flow of the river. We realize that the airport can be a rather stressful place, so our goal is to present a dynamic but ambient light installation for travelers. Upon entering the terminal, visitors can look up and find a calming animation of light that moves as they pass through. It will act a relaxing point on their journey to their next destination. It will also act as a gentle reminder of the city they are about to enter or will be leaving.